Scott grew up in a small town in western Colorado and lived a fairly typical American boy’s lifestyle. He graduated from the University of Northern Colorado in Greeley with a degree in geography, and landed a job in northern California as a cartographer (map maker) in 1991. While in California, he met a young woman, Nancy, who was a Christian. Nancy immediately invited Scott to Bible study and church (Calvary Chapel Modesto) with her. Scott began reading the Bible and praying, but he wasn’t saved. Over the course of the next five months, all of Scott’s objections to Jesus were answered. One evening, alone in his car, Scott surrendered his life to God. He asked for forgiveness of all the horrible things he’d ever done. And the weight of all the sin he’d been carrying for years was lifted. Scott and Nancy married and in 1993 moved to Colorado Springs. They attended Rocky Mountain Calvary and began volunteering in various ministries, including teaching children. In 1998, Scott started teaching Bible studies with workmates and later led a home Bible study group through the Gospel of Matthew. Scott found that promotions and raises were no longer motivating him. God was redirecting his life toward ministry. In 2005, Rocky Mountain Calvary hired Scott as part of their pastoral staff. But the burden to begin a new work for God’s kingdom was still strong. In the summer of 2006, the Coxes sold their home and moved to Windsor to start Calvary Chapel Windsor. They knew only one family in town. They started a Thursday night Bible study at their home, going through the book of Acts. God gave Scott a job with the City of Greeley as a map maker. In October 2006, Calvary Chapel Windsor was officially born, with Sunday services at the Windsor High School cafeteria. Since then, God has blessed the teaching of His word by changing lives, growing His church, and providing a new location for the church. Kevin grew up in a small town north of Santa Fe, New Mexico. He accepted the Lord at an early age, around seven, and has followed the Lord ever since. At age 10, he began serving on worship teams and has been doing so for the past 25 years. After graduating from high school, Kevin pursued music, touring with his band and with YWAM’s Music for Missions. Kevin also helped run a couple of Christian coffee houses in the Santa Fe area. Kevin met his wife, Valerie, while playing at a concert in Escondido, CA. They were married in 2005 and served together on the worship team at a Calvary Chapel in San Diego. They moved back to New Mexico for a short time and then to Littleton, CO, where they had their son, Liam, and daughter, Lauren. In 2016, the Lord led their family to Windsor, CO. They began attending Calvary Chapel Windsor and started serving – Kevin on the worship team and Valerie in children’s ministry. Kevin became worship leader for Calvary Chapel Windsor in the spring of 2018. He finds it a huge honor and privilege to lead God’s people in worship every week. Valerie grew up in Santa Fe, New Mexico. She was brought up in a Christian home but didn’t surrender and dedicate her life to the Lord until young adulthood, after moving to San Diego, California. God provided many very special mentors to disciple her as a new believer and built her faith through missions trips to China and Mexico. God brought Valerie and her husband, Kevin, together in California where they were married and served on the worship team together. They left San Diego to be closer to family. The Lord blessed them with a son, Liam, and daughter, Lauren, after moving to Littleton, Colorado. It was through their children that God began to develop a desire in Valerie to serve God through teaching children the Word of God. While attending Horizon Christian Fellowship in Littleton, God called Valerie to teach children on Sunday mornings. In 2016, God relocated their family to Windsor, Colorado, and led them to Calvary Chapel Windsor where Valerie continues to share her passion to know Jesus with children. Favorite verse: Proverbs 3:5-6 Trust in the Lord with all your heart and lean not on your own understanding; in all your ways acknowledge Him, and He shall direct your paths. God, I know I am a sinner. I believe Jesus died for me on the cross and You raised Him from the dead. I accept Jesus as my Savior and Lord. I choose now to leave my sins and live for You. Thank You for forgiving me and giving me everlasting life, because of Your merciful grace. 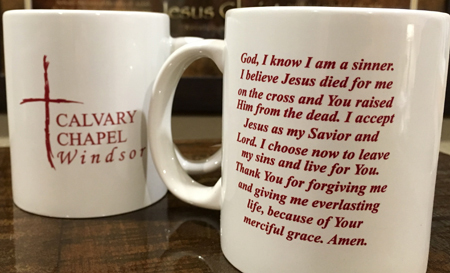 Come to church for a free mug!